The creature was identified as a hoodwinker sunfish, a recently identified rare species. 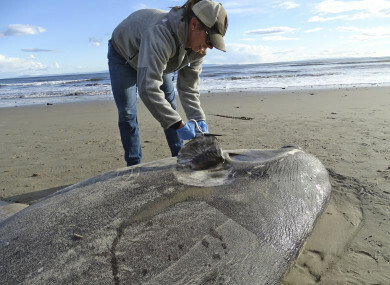 Jessica Nielsen, a conservation specialist, examines a beached hoodwinker sunfish at at Coal Oil Point Reserve in Santa Barbara, California. A 7-FOOT SEA creature that washed ashore in Southern California in the US has been identified as a rare species usually found in the Southern Hemisphere. The University of California Santa Barbara said an intern spotted the stranded fish last week at Sands Beach in the university’s Coal Oil Point Natural Reserve. The intern then alerted a conservation specialist named Jessica Nielsen at Coal Oil Point. Nielsen said that she initially thought it was a type of local sunfish and posted photos to the reserve’s Facebook page. The photos drew the attention of a man named Thomas Turner – an associate professor in UCSB’s ecology, evolution and marine biology department who examined the fish and posted photos to the iNaturalist online community. Marianne Nyegaard of Murdoch University in Australia saw the photos. She was the woman who identified the species in 2017 and formally named it Mola tecta, but gave it the hoodwinker moniker because it had somehow escaped scientific recognition. Nyegaard said in am email to UCBS that she was reluctant to identify the fish as a hoodwinker because the photos didn’t clearly show distinctive features and because it had turned up so far out of its known range. She sent specific instructions to California about what to photograph and tissue samples that should be taken. Turner and Nielsen were glad to help, but first they had to find the fish, which had been moved by the tide. Nyegaard said she ended up with a large number of extremely clear photos “and there was just no doubt of the ID”. According to Thomas, the fish was just over 7 feet long and slightly wider from fin tip to fin tip. Its dorsal fin was just under 2-and-a-half long. He did not measure the weight. Email “Rare sea creature washes up on California beach thousands of miles from home”. Feedback on “Rare sea creature washes up on California beach thousands of miles from home”.